Pope Francis is scheduled to visit the White House Wednesday morning, in what will be only the third such visit ever by a Pope. He arrived in Washington, D.C. Tuesday afternoon, greeted by President Barack Obama and his family in a rare plane-side meeting by a president. Popes and Presidents have met more than two dozen times, most of those meetings taking place in Vatican City or in U.S. cities outside of Washington, D.C. The first of those visits was between President Woodrow Wilson and Pope Benedict XV. The leaders don't always see eye-to-eye, however. Bill Clinton, for example, backed abortion rights, much to the dismay of Pope John Paul II. 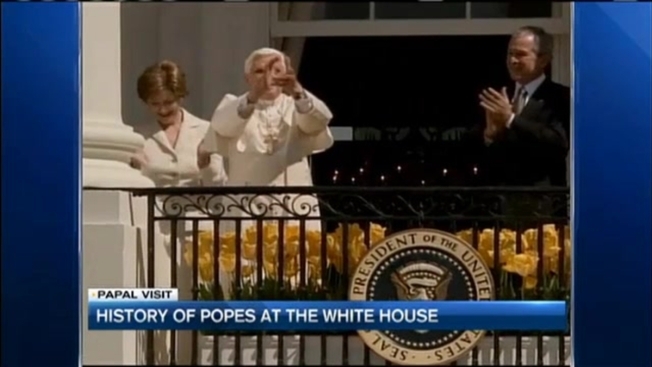 In 1979, Pope John Paul II was the first Pope to visit the White House, and president Jimmy Carter. Twenty-eight years later, it happened to be Pope Benedict XVI's birthday when he came to see President George W. Bush. That arrival, complete with a band and ceremony on the White House's South Lawn, should should give us a sense of how Pope Francis's will look Wednesday morning. Such a welcome is generally extended to heads of state. "In this case, the Pope is the head of state, so he gets the same treatment: the 21-gun-salute, the marching band, and the trumpet players, speeches, and such," White House Curator Bill Allman told NBC News. President Obama has said he's looking forward to continuing the dialogue he started with Pope Francis during the President's visit to the Vatican last year. It is expected he will meet with Pope Francis inside the Oval Office. The two leaders do have several concerns in common, noted Broderick Johnson, President Obama's assistant and Cabinet Secretary. "On climate change, on poverty, on income inequality, and on Cuba," Broderick said, citing some examples of where the President and Pope's priorities align. "In and of itself, it's really a great visit to talk about some shared values." Pope Francis has demonstrated he is not one for the fancy trappings of his office. For example, he has shunned the elegant papal apartment to live more simply. He also wears more simple footwear than many past Popes. However, Pope Francis has been open to pomp and circumstance by foreign hosts, observers have pointed out, out of respect to his hosts. The Pope's White House visit Wednesday is expected to last about 90 minutes.